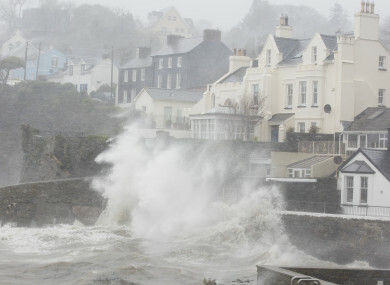 Ophelia battering Kinsale on Monday. A SENATOR HAS said that we “should be cautious” of legislation that would punish people who ignore status red weather warnings and put emergency services in danger, but said the government is “very open to looking at such proposals”. Keith Swanick said that the minister “shares the frustration and anger of many others” after reports that a number of people took to the sea against all advice during Storm Ophelia on Monday. He also outlined a number of instances within existing law where people could be punished for such behaviour. Yesterday, Taoiseach Leo Varadkar said he “very much agrees” with the sentiment of legislation proposed by Fianna Fáil’s Darragh O’Brien, which would make it a criminal offence to recklessly endanger the lives of emergency workers. Despite numerous warnings telling people to remain indoors and avoid going anywhere near the sea, photos and videos emerged throughout the day of people risking their lives by getting into the sea. Swanick said that the “blatant disregard for the safety of the brave men and women of our Coast Guard and other emergency services is staggering”. “It is more a matter of luck than anything else that no one appears to have been seriously injured while swimming or surfing off the coast on Monday,” he said. We need no reminder of course of the three people who were tragically killed on Monday during Hurricane Ophelia, and I want to again extend my sympathy and that of us all to their families and friends. The senator said that Minister Flanagan was aware that such weather events may become more frequent and that he is aware of calls for sanctions against such reckless behaviour. Swanick also outlined a number of instances where people could be punished under existing laws. The penalty for this offence is a fine not exceeding €1,000, or six months’ imprisonment. Swanick pointed out that a garda would have to be present in the first place to issue such a direction, which may not be the case during such weather events. The senator added: “The minister has asked me to conclude by saying that, ultimately, people need to take responsibility for their actions, and for putting their own lives and those of others at risk. The simple fact is that if people would exercise a bit of common sense and find within themselves a trace of respect for those who risk their own lives to save others, we would not be here having this discussion. Email “'People need to take responsibility': Laws could punish those who put emergency services at risk”. Feedback on “'People need to take responsibility': Laws could punish those who put emergency services at risk”.